I'm so glad that I read this book, especially right now with all the NSA stuff going on. It helped me to realize that these spy agencies are run by people who sometimes overstep their boundaries, but really aren't out to destroy America. The personalities of our leaders impact their policies, and their weaknesses are magnified with power. 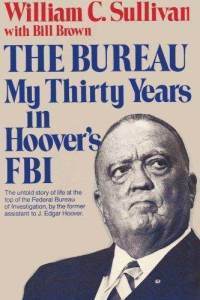 This is a gossipy and fascinating look inside the FBI under J. Edgar Hoover. It's marred, unfortunately, by Sullivan's unreliability. So many of his claims can be easily refuted, so it's his story about the FBI but just not the real story. Both interesting and full of history about our country and the FBI. For me, being into that kind of thing, I really liked it. But, not sure how others would take it. Haha Awesome book. - Wish Sullivan had lived to see the day when it was in print.